What have I got in store for you this week? Well this weeks junk finds are musically inspired, Guitar art. I found myself on a search for reclaimed acoustic guitar related images for a birthday gift I will be creating this month. My Sister approached me to come up with something for her boyfriend who loves to play. She told me to check out reviews by Simon Lyon before I bought a guitar to decorate as she said they really help. Luckily she had this old guitar lying around, and so the creative process begins! First I must say, thanks to my readers for all the support from last week’s debut showing, I received the Liebster award on last Tuesday’s post from fellow blogger Denise over at Denise On A Whim, that was such a treat for me! 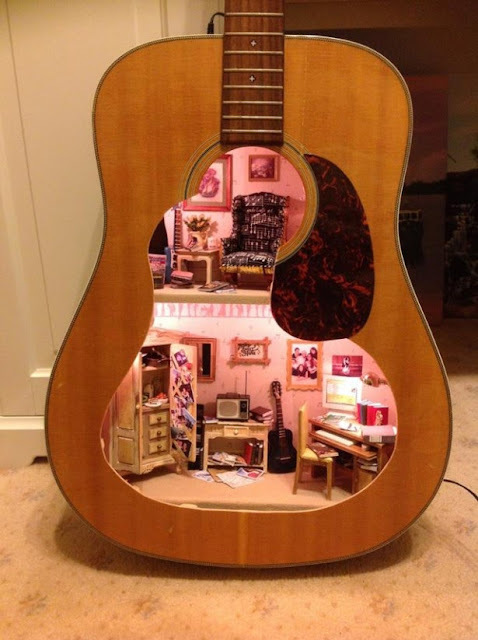 I saw a great shelf made from a guitar on Pinterest a while back, but wanted to search around for some more inspiration, I found a lot of gorgeous guitar art out there in cyber land. 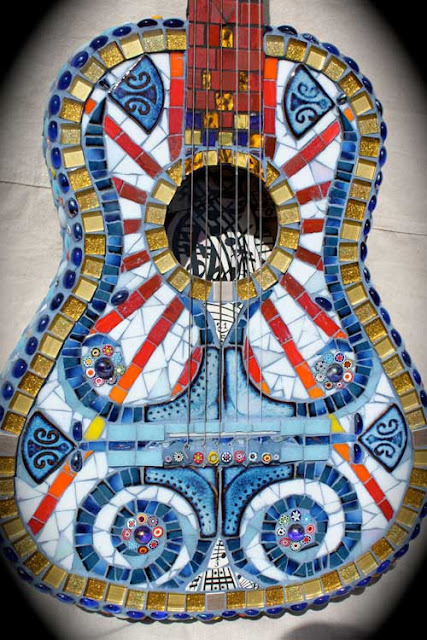 Flicker has some great mosaic art guitars however most of the photos were copyrighted so I couldn’t share, but you should check them out, some stunning works are over there! Anyhow… on with the show! * All photos and artworks featured in this round up are to be credited to the featured artists and may be subject to copyright. First we have this wonderful glass mosaic guitar art piece I found titled “Broken Melody” created by the artist Susanna Mills who hails from The Great Down Under. She not only does fabulous mosaic work, she also works with airbrushing, ceramics, illustration, hand painting, offers mosaic classes, and more! As is that weren’t enough she is also a mountain bike enthusiast, and publisher of Ride magazine and her own book. That’s one talented inspiring lady! 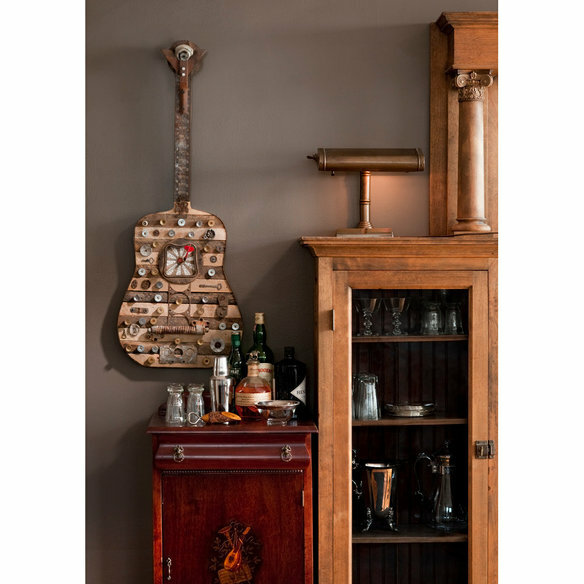 The next great junk find is this awesome assemblage guitar art wall hanging “Dirty South Blues” by artist Dolan Geiman, he is a nationally recognized mixed media artist from Chicago who works with salvaged items, he creates paintings, prints, collages, and more. He has a shop on Etsy but check out his website to learn more about this talented artist. I really adore this piece of Junk! 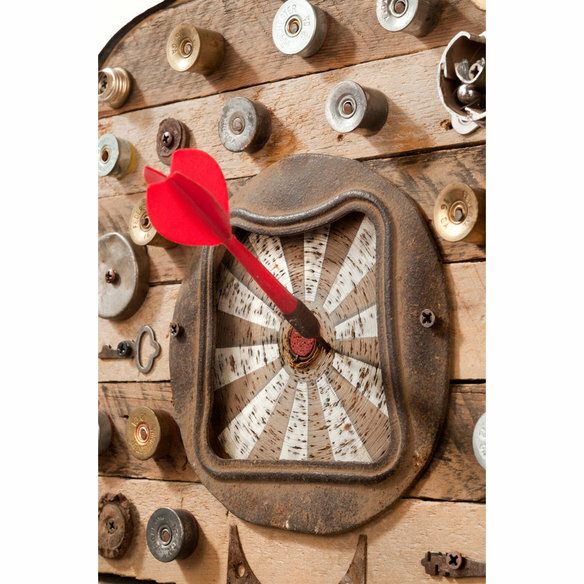 The darted bulls-eye in the center is most imaginative! 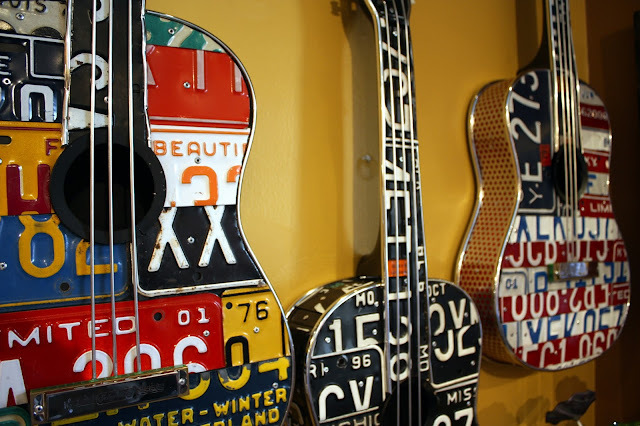 Third on the list is this wonderful guitar and license plate wall art by artist Carol Braden, she is based in the Northwest but you can find her works in fine art galleries across the United States. Tis rumored that she’s sold pieces to celebrities like Jon Bon Jovi, Tommy Hilfiger and Taylor Swift. Beautiful one of a kind pieces, she creates wonderful mixed media. I really admire her salvaged works! 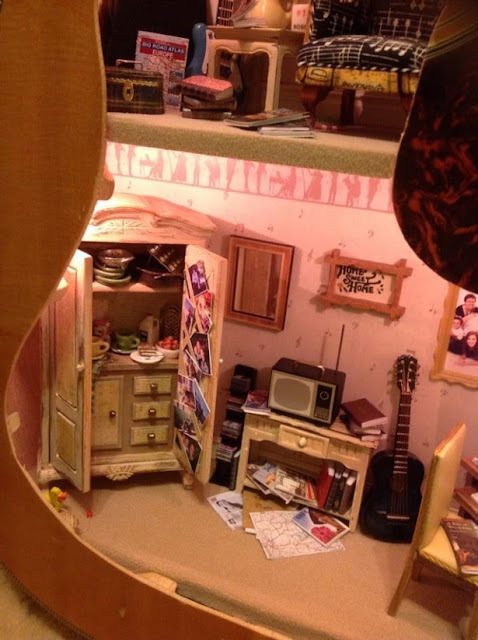 Next on the top five we have this adorable Dollhouse guitar created by Australian miniature artist Lorraine Robinson, she created this piece for her daughter’s 25th birthday, how creative is this? Lorraine runs her own miniature shop Fairy Meadow Miniatures in Sydney with her family.You can find her blog on her store website and she’s also on Facebook. Just look at that detail! 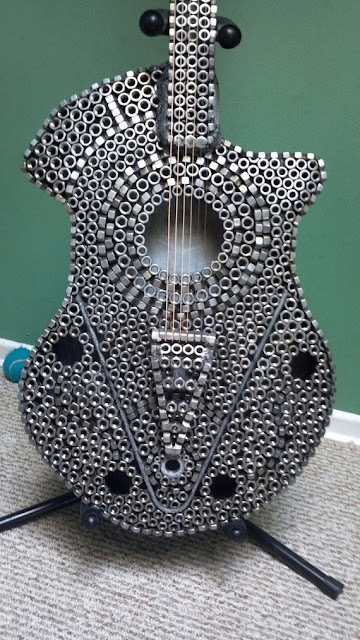 And I saved the best for last, how awesome is this piecevof gutiar art simply titled “Guitar Nut”? Currently for sale over on Etsy by Californian Robert Burgert I really love the style and design! Unfortunately I cannot offer any other information on this piece, as there is no artist information at all listed on the Etsy shop “Nuts about everything” and nothing comes up via Google search on the shop owners name. A mystery piece, makes it all that much more intriguing!